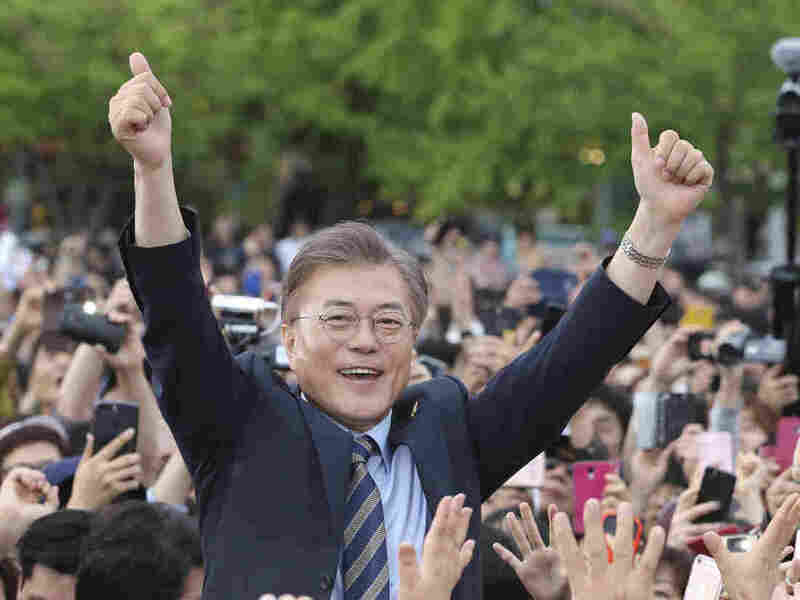 Leading South Korean Presidential Candidate Moon Aims To Negotiate With North : Parallels Liberal human-rights lawyer Moon Jae-in holds a double-digit lead in polls heading into Tuesday's vote. He says he would seek a less confrontational stance toward North Korea, a big change in policy. South Korean presidential candidate Moon Jae-in of the Democratic Party campaigns in Goyang, South Korea, on May 4. In 2009, a close aide to former South Korean president Roh Moo-hyun, who had left office a year earlier, took to a podium on live TV. He looked pale and distraught. He announced that the former president had taken his own life. It was a dramatic moment in South Korea. It was also when South Koreans first got to know the man who looks likely to be their next president: Moon Jae-in, that former presidential aide. "That is probably the seminal moment, when he become known very publicly," says Kim Jiyoon, a research fellow at Seoul's Asan Institute. "He was a chief of staff and also a very close friend of Roh Moo-hyun." Ahead of Tuesday's presidential election, polls show Moon has more than a double-digit lead on his closest challenger, a former software tycoon. Moon is from the late Roh's Democratic Party, and is likely to revive his late friend's "Sunshine Policy" of dialogue and economic aid to North Korea. Another South Korean president from the same party, Kim Dae-jung, won the 2000 Nobel Peace Prize for his engagement with the North. Under "Sunshine 2.0," as the South Korean media have dubbed his plans, Moon wants to reopen an industrial complex where North and South Koreans work together, just north of the de-militarized zone. He says he's open to meeting the North Korean leader Kim Jong Un. And he says he'd like to re-evaluate a deal the previous, conservative president Park Geun-hye signed with the U.S., to install a missile defense system in South Korea. Moon wrote in his autobiography that South Korea should "learn how to say no" to its historic ally, America. "So a lot of people are worried [that] if Moon Jae-in is elected, we're going to have rocky relations with the United States," says Kim, the political scientist at Asan. "First of all, President Trump is not really popular in Korea. And second of all, there's a really thorny issue: the THAAD deployment." THAAD is an acronym for Terminal High Altitude Area Defense, the name of the U.S. defense shield designed to shoot down North Korean missiles. It was declared operational this week. Moon says that rather than arming up, he wants to negotiate with the North. One of his reasons is very personal: His parents are from there. They were rescued by a U.S. warship in 1950, after the Korean War broke out. Moon was born in the South, just before the war ended. "Critics call him a red — a communist — because his approach to North Korea is dovish," says Tae Ki-soo, Moon's biographer. "Moon treats North Koreans as human beings, because of his parents." But defectors from North Korea, whose escape stories pull at South Koreans' heartstrings, are some of Moon's most vocal critics. Some 3,000 North Korean defectors vowed this week to leave South Korea if Moon is elected president. In the banquet room of a high-rise hotel in Seoul last week, North Korean escapees sang the South Korean national anthem, and pledged allegiance to the South's flag. Representatives from most of South Korea's political parties gave speeches, wooing the defectors' votes ahead of Tuesday's election. The conservatives parties got hearty applause, but the response to liberals was barely lukewarm. "Moon Jae-in should not be president," says Lee Yu-mi, one of the banquet's attendees, who defected from North Korea 11 years ago. "He's too soft. He'll give money to the North, which will strengthen the regime there." In a recent TV debate, Moon sought a tougher image by holding up an old black-and-white photo of himself in the South Korean Army's special forces, some 40 years ago. But he's better known for his years as a human-rights lawyer and, before that, a rabble-rousing student protester who got hauled into jail several times. If elected South Korean president, Moon now wants to be a negotiator — with Pyongyang, one of the most unpredictable regimes in the world.